Please welcome Jennie for today’s reader interview. Tell me about yourself: I am 52 years old, mother of five children aged 32 till 12, divorced. Born and raised in NY, living in Israel since 1977. I am an RN, presently studying for my BSc in Nursing in university as well as working in a community clinic. How is your cooking style different from your mother’s? I use more whole grains and pulses, and possibly more vegetables. I make much less beef, fry less ( hardly at all), use things like tofu which we had never heard of or used back then. I remember her refrigerating soups overnight and then taking off the layer of congealed fat, which I do as well. I can only hope that I am as good a cook as she was, may she rest in peace. What is your favorite gadget? Hmmm that is a difficult one to answer. I get a lot of use out of the pressure cooker and the Magimix food processor, which I try to find even more uses for. I also like this soft plastic lemon shaped lemon squeezer- you put half a lemon in and squeeze, the juice comes out and the pits don’t. Over the years I have found that less is more, and that quality pays off. I invested in a quality food processor and try to save and buy high quality products, rather than a lot of junk. A good knife, a good cutting board, good pots with thick bottoms, are worth the investment. I have also found that a good spatula can be used in many situations besides baking- for example emptying out that mayonnaise jar, peanut butter, etc. Also funnels are essential, though one can make do with a funnel made of paper. Do you entertain, and in what circumstances? What is the biggest party or meal you have hosted to date? I don’t really entertain much. I have in the past, including one of my son’s Bar Mitzvah. I was 9 months pregnant at the time. I baked endlessly, freezing the cakes, rolls and challahs. I cooked and baked chickens, meats and such, for days ahead of time. I did get some help from relatives, but did most of the work, with planning ahead. I don’t remember how many people came but there must have been at least 50. I have had holiday guests of course but not that many. Can you share a typical daily menu? Weekly menu? Breakfast: Cornflakes with milk, or toast with cheese, or a yogurt and fruit. Lunch: Chicken or meatballs, or once in a blue moon hotdogs, sometimes corn shnitzels, accompanied by either rice, or pasta, or quinoa, or potatoes, and a veggie, peas, beans, broccoli, or a mix. Hopefully also a fresh salad at lunch but not always. In winter, usually also soup. Dinner: Usually dairy- eggs in some style, almost always a salad, sometimes with tuna, sardines, mackerel. Sometimes pancakes, or french toast, or egg-in-a-hole. My younger kids like to create interesting toasts for the toast machine. They slice tomatoes, put on tuna, a bit of ketchup, maybe basil or bermuda onion, and cheese. How has your cooking style evolved over the years? I have learned to cook the amount I need and not to go overboard, which I often did in the earlier years. I have learned that for my family, simpler is better, most of the time. They are not spoiled and as long as it is tasty, will eat it, with few exceptions. I am a benevolent dictator 😉 and never force fed, but whatever I served is what there is, there are no individual orders taken in my kitchen, and you eat what is on your plate or you don’t eat. No biggie. I have yet to see a healthy child starve himself, but I have seen mothers get neurotic about food. Can you recommend any cookbooks, TV shows or websites that have inspired you? My first cookbook was the American Jewish cookbook, which I still have and is falling apart. It was my bible for a few years. I bought a wonderful book once here in Israel written by an American, Mindy Ginsberg called Plain and Fancy, or Kal, Mahir v’eleganti in Hebrew. The book is in Hebrew. Every single recipe I have ever tried has come out absolutely wonderful. I have lots of cookbooks, ethnic etc, and to be honest have not applied many recipes for food from them. I just enjoy reading them. In baking however, I do try new recipes. I love working with yeast bread and making bread and rolls, and usually do it without a book but sometimes I like to try out new recipes. The internet of course is another source. One of my favorites is Feed me Bubbe which if you haven’t seen yet on myspace, you MUST!!!! I learned from her, to top a noodle kugel with milk, pretty much to soak it, before baking, and it comes out sooooooo good. What posts on CM have you enjoyed? Do you have suggestions for future posts? I like all of them but especially like the ones about using leftovers, about ways to ensure food safety, and about ideas for school food. I would like more of those, as well as easy dishes that don’t involve meat. What is the most unusual dish you’ve ever made? Brain, and chicken FEET- needless to say I didn’t make either again. What is the oldest item in your kitchen? The newest? The oldest item is a wooden bowl and spoon. The bowl belonged to my mother and possibly hers, and as I remember she would chop liver in it. I also have an old hand mixer. I also have Tupperware that must be a thousand years old, containers and cups. I am Tupperware loyalist, it really does last. The newest thing is a coffee grinder given to me as a gift by guests from the US who stayed with me this past summer. I love coffee and grinding it produces the most heavenly scent. What would you like to change about your cooking style in the coming year? Less meat, more grains. I was a vegetarian for about five years and went back to eating meat about three years ago. I want to move back towards vegetarianism or at least nearly, for both me and my family. I would also like to become more efficient in preparation of items that can be ready in the fridge for during the week, to save me time when I am working and studying. I also want to get the kids more involved in cooking. My son says that my pea soup rules. I use the pressure cooker for this. I fry a chopped onion in a little bit of oil in the pot. Then I add about a cup of dried split green peas to the pot, after washing and checking them. I add water, one or two finely chopped carrots, a chopped potato, and occasionally maybe half a finely chopped sweet red pepper. Black pepper, a little salt, a little chicken soup mix, and sometimes a drop of tumeric for color. That’s it. They love it with soup almonds. They also love my macaroni and cheese, in which I always use up all the cheeses that are on the verge of being tossed out. I sometimes add some Heinz ketchup to it. Personally I like my quinoa salad. I prepare the quinoa according to directions. Cool. Then add dried cranberries, chopped nuts, a little bit of chopped bermuda onion, fresh cilantro (which I love on everything) salt, pepper, olive oil and lemon juice. It is heavenly. One other weird dish I like for breakfast in the winter is oatmeal, cooked in water. I let it cook on a small flame and let it thicken really well. Then I turn it off, add chopped cilantro, about a teaspoon of olive oil and a drop of salt. If you use about 3 tablespoons of the oatmeal, it doesn’t go past the recommended carbohydrate amount for people watching their weight. Plan ahead, make sure everything is in arm’s reach BEFORE you start. Chop, slice, grind, whatever you need, first. Then start. Use good quality ingredients. I have tried skimping and it always turns out to be a flop, a waste of time and energy. My mother taught me that a good cook is a clean cook. That means that you don’t let a mess build up as you cook. You clear the area as you go, get the dishes done and out of the way. I have learned, and I think I also saw this in one of your posts, that if you plan the steps properly, you can often use the same pot in various stages of the cooking, without even washing, depending on the ingredients. I too love cilantro on just about anything and everything. That oatmeal recipe sounds very interesting. I’m going to have to try it soon, once the mornings get a little cooler. The picture above, named “haminebake” looks great! Where is the recipe? thanks! This cholent is basically Moroccan style, but I put it together according to what my children like. I soak chickpeas overnight. Sometimes I also soak various beans. I rinse the water several times. 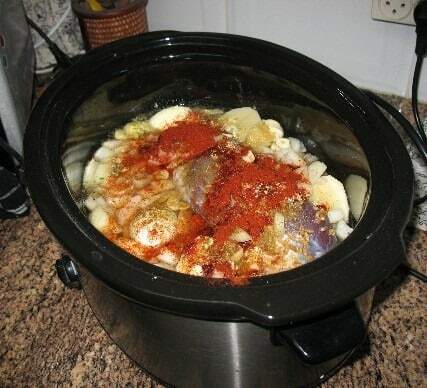 I place it on the bottom of the slow cooker, or pot if I am putting it in the oven. I sometimes place washed pearl barley over that, and sometimes add washed lentils too. The meat might be a cheap cut of beef, or chicken, or sometimes turkey necks, which cook very well in cholent. I cook rice separately in a pot, using less water than usual, and then transfer it to a cooking bag, and place it on the items in the pot. Another delicious addition is pearl barley, cooked like rice, and placed in a cooking bag. It comes out deeeelish. I place small potatoes (or large ones cut into large pieces) and sometimes sweet potato. Then I wash a few eggs in the shell (soap and running water, carefully) and place them in. I spice it all with some honey, sweet paprika, lots of garlic, onion, black pepper, salt and sometimes chicken soup mix. 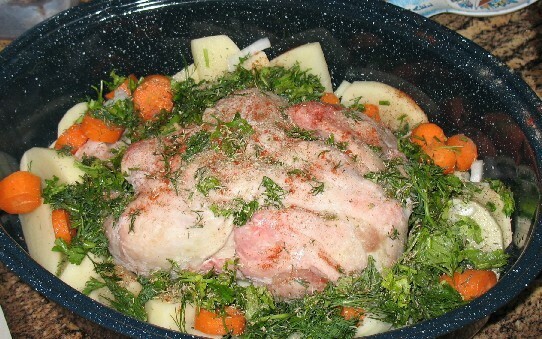 I cover it with water, bring it to a boil and then cook on a low flame until it is time to put it into the oven. Once in a while, I prepare a mixture of ground meat, spiced with onion, parsley,spices, chopped nuts- shaped like a loaf and put into the pot. Recently I began experimenting with “kuklot” which are dumplings made with ground meat and also semolina. They are placed directly into the boiling mixture, and absorb the flavor and liquid. 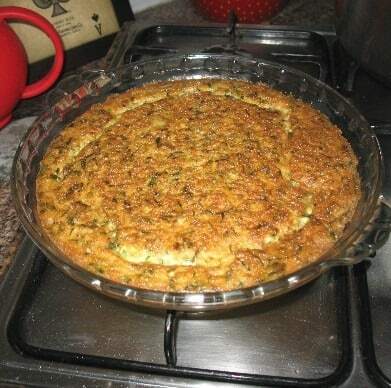 There are many recipes for the koklot, many without meat. Now all I have to learn is to make LESS and get over my obsession of cooking too much! Thanks for the info! What temp/time for slow cooker? Really makes me want to prepare!